Spiral of Gratitude is a Shimon Attie/San Francisco Arts Commission/BALEAF public memorial to honor the survivors of police officers who were wounded or died in the line of duty. Margo Perin was commissioned to create the poem inscribed into the glass sculpture in the shape of a spiral moving upwards towards the heavens. The poem reflects the sentiments of survivors based on information gathered in interviews by Margo Perin with the relatives, partners, and co-workers of police officers who were lost in the line of duty. 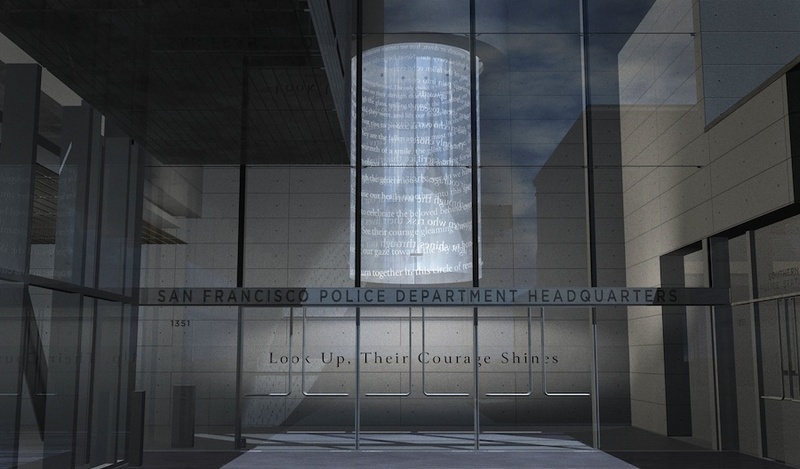 Spiral of Gratitude is located in the foyer of the new Police Headquarters in San Francisco, due to open in April 2015. The poem also appears on a plaque next to the Wall of Names in the lobby. Let us turn together in this circle of remembrance as the light shines through our words. And we lift our gaze toward the sky to honor the men and women who risk their lives in the line of duty. See their courage gleaming through the glass, spilling through the words of our love. Band with us to celebrate the beloved behind every star. Draw on their courage, their strength, their honesty. to honor the sacrifice that ripples through time, through the generations. Never do we have the gift of goodbye. The only choice is to carry on, make our peace. An object in motion keeps moving forward. the glint of an eye, the tilt of a head. and we must not fall. We can move back or forward, upwards or down, but we cannot remain still. We must rise to protect, as they did. and lift our heads as we ascend toward the light.